I promised to post some more wild garlic recipes… I made these flat breads on Saturday with a wild garlic butter roast chicken and potato salad for some friends. As usual I got carried away serving and eating and forgot to take pictures of anything besides the flat breads. I cant bear to read a cookbook with no pictures to keep my stomach engaged while my mind is wandering over the words so I will apologise for the limited visuals here and you will have to take my word for it that the chicken was lovely too and worth trying out instead of the usual herb butter under the skin. The wild garlic gives the flat breads a lovely pale green tinge as well as a faint hint of garlic flavour and stuffing the butter under the chicken skin leaves the meat beneath with the same gentle after glow of garlic rather than the overpowering bear hug of garlic you would get if you tried to put this much of the normal stuff into one dish. The chicken needs no recipe – just stuff about 125g of wild garlic butter under the chicken skin (garlic butter recipe, if you can call it that, is available on my wild garlic post for totalfoodgeeks.com)and roast as normal. I also stuff half a lemon up its deriere for good measure. The basic flat bread recipe is adapted from one by Jamie Oliver for jalapeno flatbreads, also very good and basically idiot proof. When it comes to bread, I am the idot. Mix the flour and baking powder in one bowl. In another bowl mix the yoghurt and wild garlic and add to the flour. Mix until the dough comes together, then turn out onto a floured surface and knead gently until smooth. Divide into 8 portions and roll each one out into a flat circle. 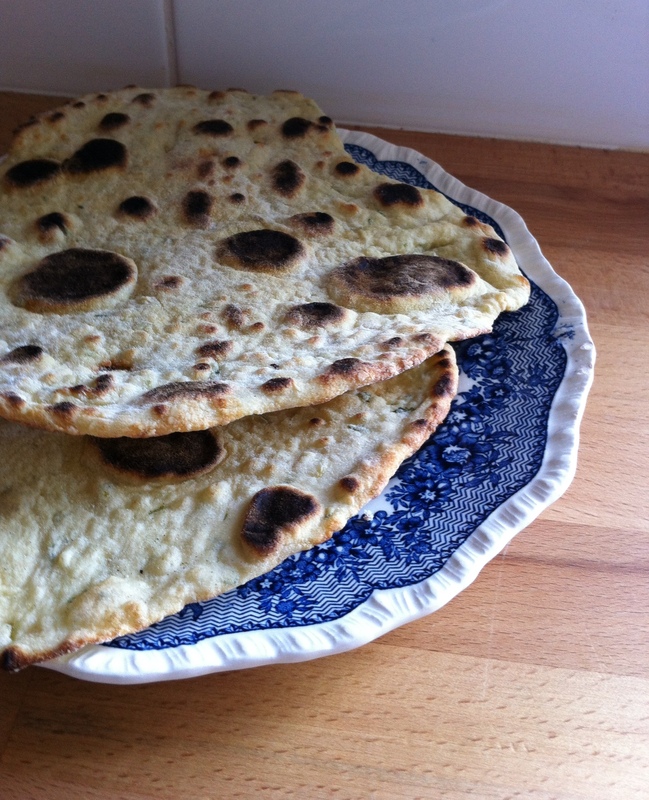 Preheat a dry frying pan over a med-high heat and cook each flat bread for a few minutes each side. flip them over when bubbles start to swell in the dough and the bottom is browned. You can keep them warm on a tray in a low oven while you cook the rest. My first post for the site is over on Total Food Geeks peoples! 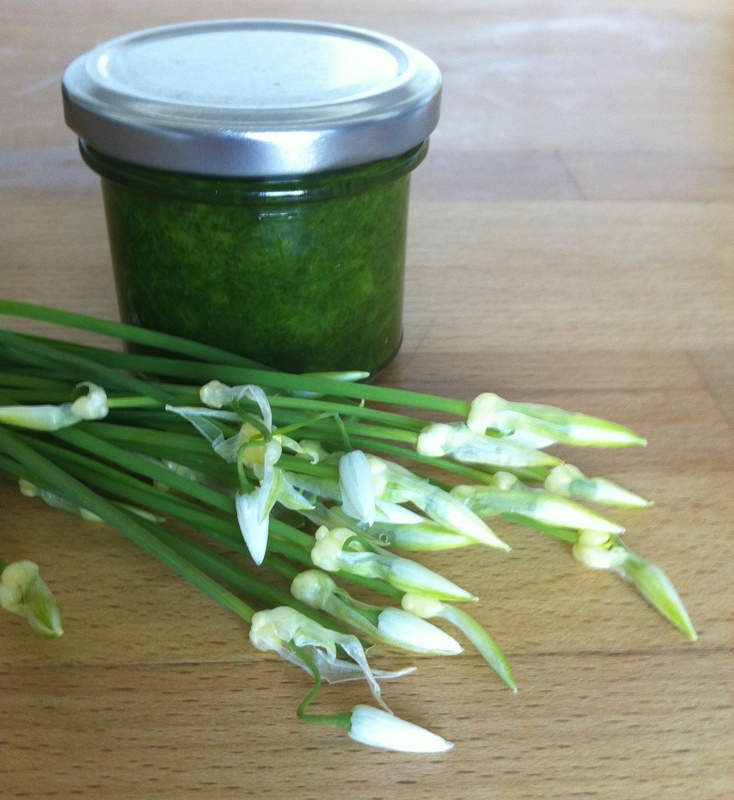 … some more wild garlic recipes to follow here in a few days!